For many of us who like to form mental models as we search, it’s useful to go beyond the “run-of-the-mill” search engines like Google and Bing to explore more visual ways of searching. 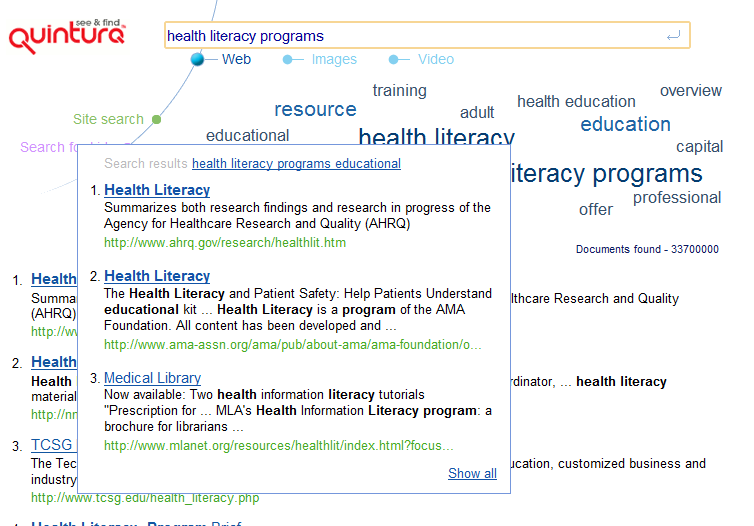 In this post, I’ll discuss some search visualization tools. Search from multiple content sources (web, news, video, images, blogs, podcasts) using Nexplore and view your results in a variety of different formats (e.g., summary, gallery, and line). 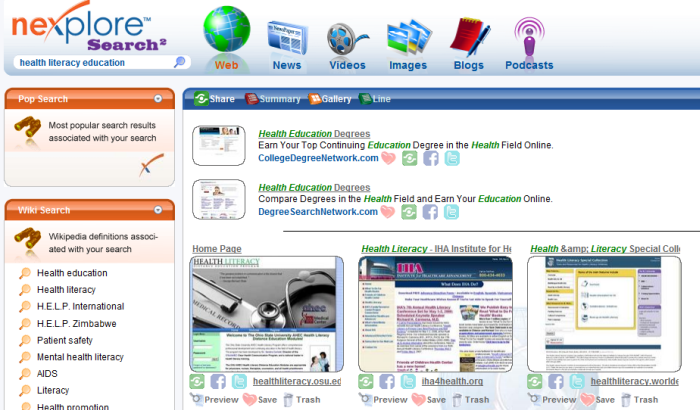 Each search result comes with functionality (save, trash, bookmark & share, share on Facebook, share on Twitter). I particularly like the save option which allows me to collect a number of search results with potential so I can view them later. Need more search ideas? You can view search suggestions at the left side of the search display. The summary view is shown below. When you’re in gallery view you also get a preview option and thumbnail images of different content sources. Offering web, image, and video searching, Quintura allows you to quickly experiment with search terms by viewing top results for alternative search combinations. Sortfix offers a very intuitive way of conducting advanced searches across multiple search engines (Google, Bing, Twitter, images, and YouTube), though not at the same time. Your initial keyword selection will result in a display that includes “power words” as well as your original search terms (in the “add to search” box). These are terms that will have the most impact in focusing your searches and you can choose to remove them or to add them to your main search term list. When you add search terms to your search list, you can create keyword combinations simply by dragging one word closer to another. What I like about Sortfix is the ability to quickly experiment with different search strategies and to compare results across different search engines. You will see the dreaded sponsored ads first but looking through the non-sponsored ad list reveals very relevant results and it is quite interesting the see the differences between Google and Bing search results. A video on using SortFix is below. TouchGraph has a very specific function—to demonstrate the network of links between different Web pages. A cluster of links represents sites that are connected to every other site in the cluster. You can control your display by zooming, changing cluster numbers, and changing the spacing between web page representations. On the left side of the screen, you’ll see the urls of the various items in your network of web pages, and clicking on any one will allow you to preview a brief description of the Web page associated with the link. Why is this useful? It allows you to find “authority” sites to which many other web sites have linked. This can be valuable for SEO optimization, since it allows you to target sites that would have the most impact should you ever convince them to link to your own site. Outside of its marketing purposes, TouchGraph is an interesting way to use crowdsourcing to identify sites perceived as important and to see sites that offer different perspectives on a topic. You can use keywords or urls to search. For example, I was curious to see sites that linked to the National Action Plan to Improve Health Literacy, reasoning that this might reveal sites that are interested in commenting on or even carrying out the plan. TouchGraph is certainly not a tool to rely on exclusively, but it offers a different perspective on the actual web nature of the World Wide Web. Of the ones I described, I think my favorite is Spezify. Spezify mixes search results up on a bulletin-board-like display, letting you see text, images, and video content, as well as content from social media sites such as Twitter. You can filter your search results to exclude certain types of media from your display for a more focused search. You also can bookmark and star favorite links using the Specify interface. In my opinion, it’s really important to “shake up” your research by using a variety of different search tools. This helps you to avoid the tunnel vision that comes from only relying on a single search engine like Google (and worse, from only relying on the first search page!). Mixing search engines and search collections (text, images, and video) can help you identify new patterns in information and can make searching a more mindful practice. This entry was posted in instructional design approaches, search engine visualization and tagged nexplore, quintura, redz, search engine visualization, search visualization tools, search-cube, sortflix, spacetime 3D, spezify, taggalaxy, touchgraph, viewzi, visual search engines, visual searches. Bookmark the permalink.